Within the leisure industry it commanded everything that HUSS was known for. While it was not the cheapest model to purchase, it is by number the most common make to this day; well ahead of similar copies made by Mondial, Vekoma, Fabbri and Moser. While there are around 14 original HUSS Top Spin units travelling the fairs of Europe and 1 in North America, the majority are park models due to its large structure (3.5 trailers), road law restrictions outside of Europe, and the 27 tonnes of water ballast to stabilise each of its support towers. Topsin II – a more transportable, compact 28-person unit with no ballast requirement for the towers. 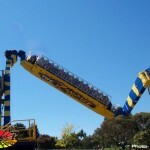 Giant Top Spin – launched in 2000 in HUSS’s Giant Rides range – 68ft tall, it can hold 77 persons. Only one has been built to date. That movie of the ride being operated in manual mode is absolutely crazy. Suprised how no one felt sick afterwoods. But I can’t believe that haha. 107 flips! Love this ride, the restraints can be a little uncomfortable but the ride is outstanding. Two thumbs up! Yep this ride is awesome. 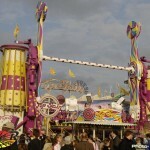 I wouldn’t mind having a go on the giant one holding seventy riders at a time! I reckon the atmosphere would be better than a roc concert. makes me nausious just looking at it but im goin to kennywood june 24th and they have one there but its a different name im sure il ride it. King’s Island in Cincinnati, OH (USA) has the 77 person model. It initially opened as the Tomb Raider ride but is now called The Crypt. It is completely indoors and adds many special effects through props and lighting. Very cool experience. Great ride. Saw the video where some members of onride.de did 107 flips. I would like to better that on the Top Spin and go for 150 to 200 flips in a row. Can be contacted at bdbell1940@yahoo.com as I live in Florida. Awesome flips. Three flips 1st, then five flips the 2nd time. 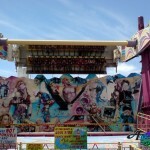 On hot days they should turn the water jets up and get the riders wet on the last dip before the ride ended. I remember that Adelaide crash. I worked with Huss on many rides with fountains. That one in Adelaide wasn’t a Huss, it was built by Fabbri Group of Italy. Miner’s revenge – Gold Reef City S.A = Awesome!!! 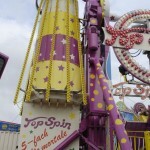 The Giant Top Spin was pretty much a failure and was to big for it’s own good. 2-3 years ago they tore an entire row of seats off the gondola to reduce the stresses on the ride leaving the capacity somewhere around 50 riders. Still pretty huge though. This ride is an indoor attraction at Kings Island in Ohio. It was named “Tomb Raider” (from the movie and was themed as such). Stalactites on the ceilings with impaled skeletons and the water below looked like lava as the water jets slowly rose to your face. The park was purchased by Cedar Point and they renamed the ride. 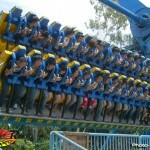 Whew, one of the nastiest rides ever. remember first time i rode it when i was 12… DAMN. 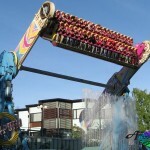 If someone wants to ride this one and is in Finand, there is one at Linnanmäki in Helsinki. 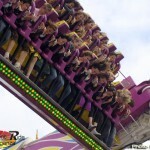 This ride looks so awesome!! Never been on it before but I will be at the New York Orange County Fair this year :D So excited!! 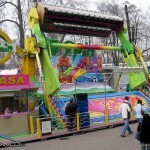 I Would NEVER ride this!!! i hate going upside down!!! Awesome piece. Rode one in Germany many years ago. Too bad Huss never made a smaller travel friendly model for the States. Here in Mexico City it’s an original HUSS, but it stopped working some years ago, I rode it many times and it was cool. 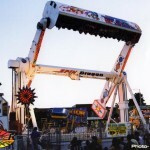 The only Giant Top Spin is @ Canada’s Wonderland called Riptide dp (during paramount) it was called cliffhanger. Still its an awesome ride and you get totally drenched on this thing. Riptide at Canada’s Wonderland is not a Huss Giant Top Spin as it is a Mondial Splashover which features two 20 seated gondolas with an overall capacity of 40 passengers per ride. It has been operating since 2000 and is really fun as you get suspended upside down three times, twice backwards and once forwards. 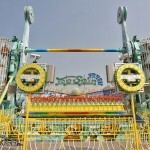 This ride also features water fountains on warm days that get completely soaked twice during the operation of the ride. 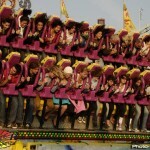 There’s a Top Spin called “King Chaos” at Six Flags Great America in Gurnee, Illinois! 34ilikepie The only giant Top Spin ever made was called The Crypt at Kings Island. It was removed relatively recently. It seems exciting and thrilling. Is it enough safe? It is the key point that I am concerned about.